In times when you least expect, you'd get to places. 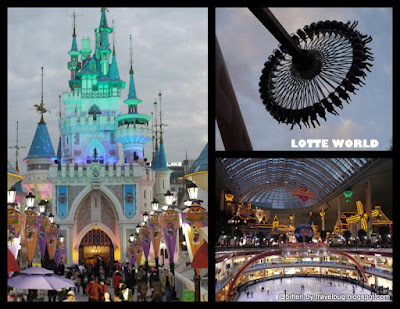 South Korea is in my bucket list for years, however, every time I make plans, it just foils. In a totally unexpected time, I finally pulled it off. 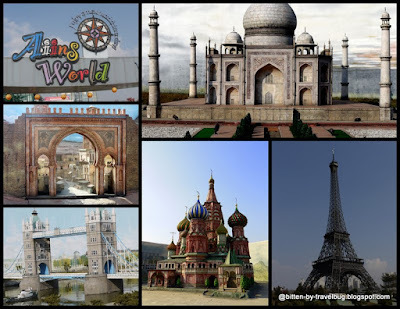 With little time to plan, we opted to gather quotations from different travel agencies. Going to South Korea on a private tour is expensive, a five day trip can ran upto $3000 per person. I bumped into Rakso Travel on the web, they offer package tours to South Korea at pre-arranged dates. With just two weeks before departure, they accommodated us and assisted us in our visa application. We arrived NAIA3 close to midnight to meet Rakso Travel's representative. 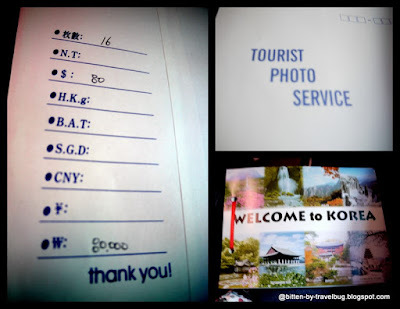 They assisted us with our check-in requirements and gave instructions where to meet the guide in South Korea. Our red hour flight with Asiana Air was scheduled to leave past midnight and will arrive at four in the morning. The flight is about 4 hours; which means, we will have a short sleep then we will be sightseeing upon arrival. Asiana Air has wide seats with tight leg room and narrow aisle; and the food does not satisfy my palate. We arrived at Incheon Airport at sunrise. Since I'm not a morning person, seeing the sunrise was a treat. We were met by our guide at the airport. The tour operator in Korea was Nancy Tour/Travel Alliance. We were about 30 in the group; young and old. The big bus was more than enough to accommodate us. 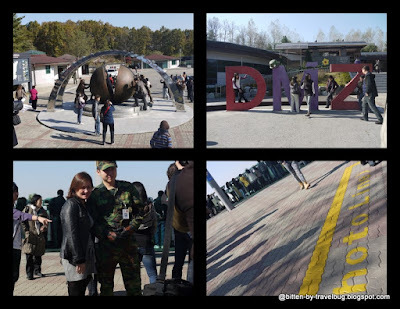 First stop was the Demilitarized Zone (DMZ). DMZ is a strip of vast land running across the Korean peninsula which serves as a buffer zone between the border of North and South Korea. In the Armistice Agreement of July 27, 1953, the DMZ was created as each side agreed to move their troops back 2,000 m (2,200 yards) from the front line, creating a buffer zone 4 km (2.5 mi) wide. The Military Demarcation Line (MDL) goes down the center of the DMZ and indicates exactly where the front was when the agreement was signed. Since its demarcation, there have been several attempts of incursion by N. Korea; however, the latter denied direct responsibility. At the DMZ, S. Korea intends to showcase to the world N. Korea's incursion by giving the public access to tunnels made by N. Korea in their attempt to cross the borders. Four tunnels were discovered to invade South Korea; these are now blocked off with concrete. Treachery continues upto this day, now I understand why these two countries remain at odds, while I was studying in Beijing, these young Koreans could not even share a classroom. Inspite of these, South Korea (the more progressive country), invested in N. Korea's industrial zone (just by the border) to give livelihood to N. Koreans. Dorosan Station gives access to and from Pyeongyang, North Korea; but not everyone is allowed to cross border. 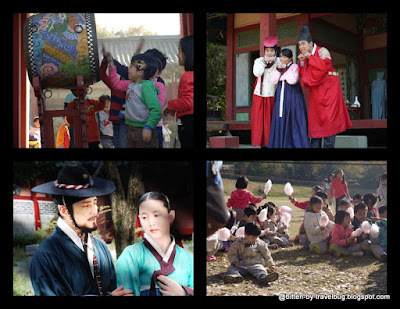 Daejanggeum Theme Park is the first drama theme park to open in Korea. It's a filming location within the MBC Yangjoo Culture Valley where a life size old Korean village was set with drama props, royal dishes and costumes. The set is quite old and does not look impressive anymore. Take bus 2-4 or 108 (bound for golf course). Get off at MBC Yangjoo Culture Valley (Travel time: 15 min). King Sejong's Status sits high and mighty along Sejong Road, at Gwanghamun Plaza. Its a plaza right in the middle of the highway which leads to Gyeongbok Palace. Since I missed the Gyeongbok Palace tour (included in the package) on my own, from the Dong Wha Duty Free Shop, I walked along Sejong Road, walked passed Gwanghamun Plaza and had a quick stop at Gyeongbok Palace in time for the changing of guards. The Presidential Blue House is at the back of this palace, entry is not allowed, on the bus, we just passed by it. It's nothing but a house with blue roof, it's not really a must see. 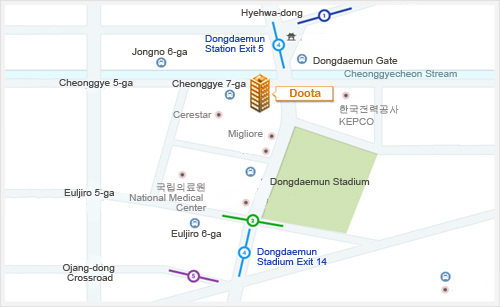 Directions: get off at Gwanghwamun Station (Seoul Subway Line 5). 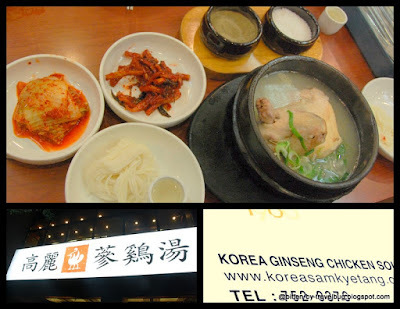 After Dae Jang Geum, we were headed to Seoul. 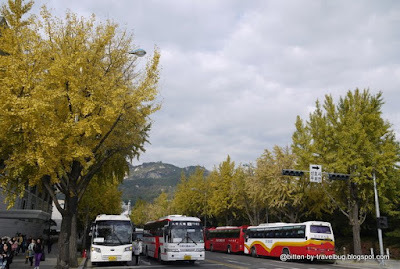 We went around the city by bus before finally getting off along Sejong Road for walk by Cheong Gye Cheon. It is a stream running through central Seoul from west to east restored for aesthetic value and the mayor's aim to have an ecological-friendly urban area. They spent U$210 million to restore this. Its architecture was impressive, a stream running in the middle of the city is definitely an eye candy. Next day... Not included in the tour, my group headed for Nami Island early in the morning. We took the taxi, train and subway. Publick transport in South Korea is affordable. A trip to Korea isn't complete without us going to Nami Island, popularized by my all time fave koreanovela Winter Sonata. I loved the place so much, I had to write about it in a separate post. 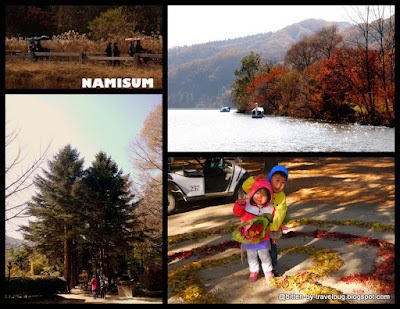 Click on these link and read about our experience here and how we got to nami island here. The English Village became a popular tourist attraction after the Korean TV Drama Boys Over Flowers was filmed here, the name Gu Jun Pyo, rings a bell right? 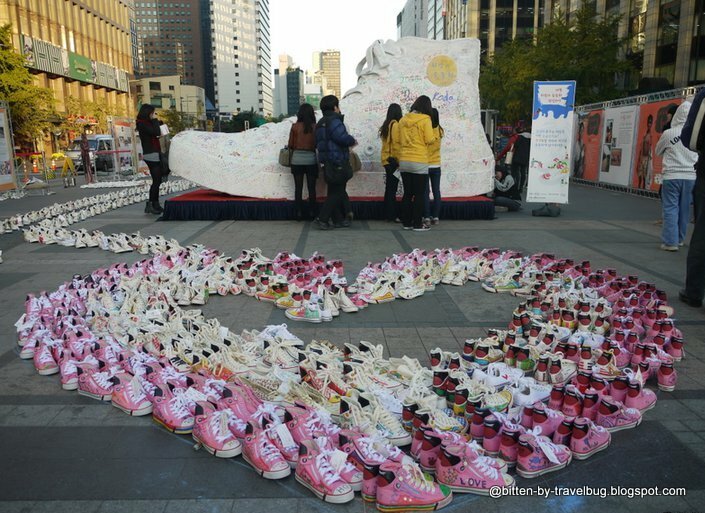 The Gyeonggi English Villages was set up to improve the local's english language skills. It offers an environment where students, families, and teachers might experience in a foreign country. The architecture looks very... English. Located at Mt. Namsam, N Seoul Tower offers a view of the city. We took the cable card ride up, but it doesn't necessarily take you to the tower's entrance, one has to walk a hundred flights of stairs to get to the main entrance, an elevator ride to the observatory. Something unique here was theTeddy Bear Museum. Teddy Bears in Korea does not have any significance in its history. 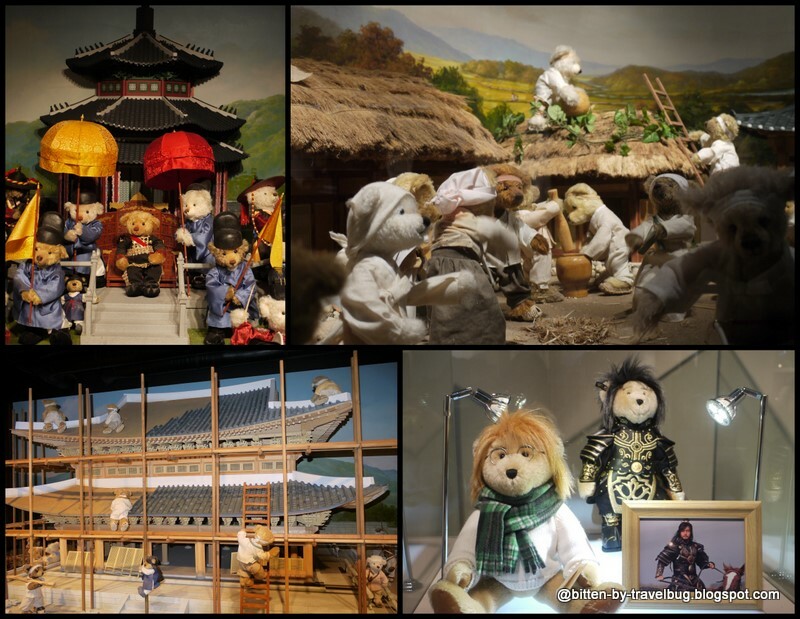 It just depicted Korean history and culture with Teddy Bears, and it was soooo cute (some are animated). If you're in for more theme park, visit Everland. Songnae Station (Seoul Subway Line 1), Exit 2. Take bus 5-2 and get off at Aiins World (15 min ride). Or take bus 7-2 from Songnae Station to back gate of Aiins World. silk worms (at DMZ) anyone? I don't know what got me, i got adventurous and it was eww, eww, EWW! food courts use these hi tech gadgets. It took quite some time before we figured it out. 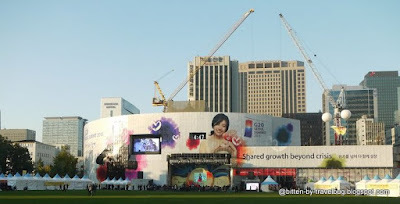 You can go for budget, mid to high-end shopping in Korea. More popular shopping areas include: Namdaemun, Dongdaemun and Myeongdong. For more detailed information, click on this link. One thing I don't like about package tours are the mandatory factory stop. This tour was no exception, knowing that we will skip a day to go to Nami Island on our own, the guide swapped the itinerary for us not miss the mandatory factory stop. Of course she didn't tell us that, but it was just too obvious. Amongst the mandatory stop, was a ginseng factory and amethyst factory. Although it was such a waste of time, it wasn't all too useless, I was able to get some training chopsticks for my niece. She loves it so much, she packs it by herself almost every time we go out for a meal. Dong Wha Duty Free Shop located near Sejong Road, has quite a good selection of high end brands. When shopping for duty free in the city, luxury items cannot be handcarried, they are to be claimed at designated counters in the airport upon your departure. Korean Food and Souvenir Supermarket near the Incheon Airport was our last stop before heading to the airport. 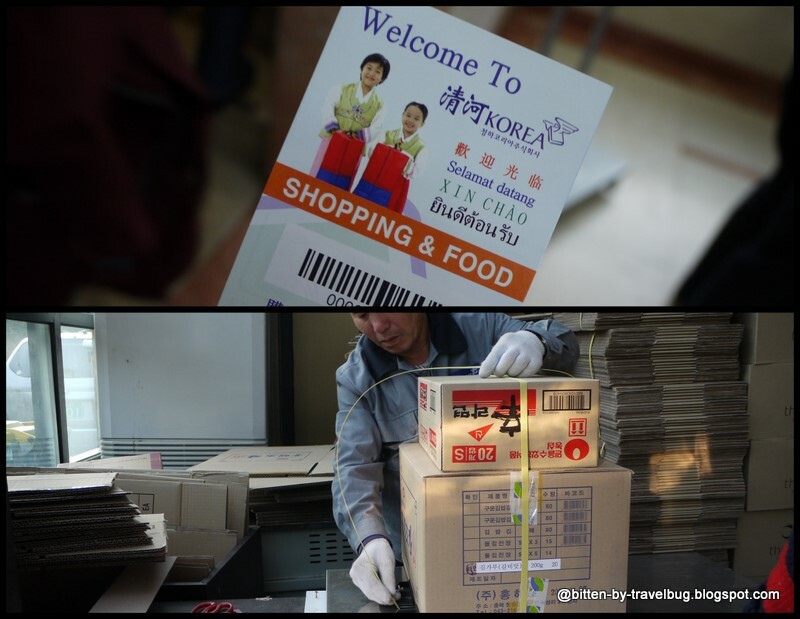 They have a good selection of boxed goodies (cookies, candies & more) of Lotte and others manufactured in Korea, bottled kimchi, clothes and more. I must be in shopping mood here and bought pricey two kyocera ceramic knives, winter stocking and loads of Lotte Pepero almond cookie sticks that totaled 200,000 won. They pack your stuff in boxes ready for check-in. As part of the package, we were checked-in JW Marriott Hotel Seoul, a five star hotel. According to our guide, we were lucky that we were checked-in here, it's definitely an upgrade to their usual 3 star accommodation included in the package. One thing about Korea is the absence of bell boys, according to our guide, guests carry their own luggage to their rooms in Korea - even in five star hotels. It was not located near anything interesting, except that it leads to a shopping center behind with a row of restaurants and a subway station. Service was good, the staff can speak English and we normally ask them to write in their alphabet where we are heading to show to the taxi driver. The complimentary buffet breakfast was great, facilities are at its best as well. It was definitely a good night sleep every night. As mentioned above, mandatory factory stops in Ginseng Factory and Amethyst Factory is included in the tour. Unlike in other countries, they are not too pushy. But there's another tourist trap which is the Tourist Photo Service. A photographer joins the group everyday, although our photographer was very nice and help us out in our needs. The guide reiterated too many times, saying just think of paying for his services and not necessarily the pictures; we felt obligated to pay for his services. For a group of 6, we got two albums, our bill was about 150,000 won. Good thing we weren't much of a cam whore. Another family of three had to pay 200,000 won. Too much for an obligatory tip, don't you think? Everything could have been perfect except for these tourist traps. Nevertheless, South Korea's finally off my wishlist but I'm coming back for more, not on a package tour perhaps, in winter time. 63 days to go before Christmas and I'm already dreaming of a white Christmas. - Tour Insurance for 60 years old and below. Rakso Air Travel & Tours, Inc.
3rd Floor Rico Bldg. 112 Aguirre St.
Day 4 When travelling with kids, go to Everland. Adults can opt to go skiing during winter season.